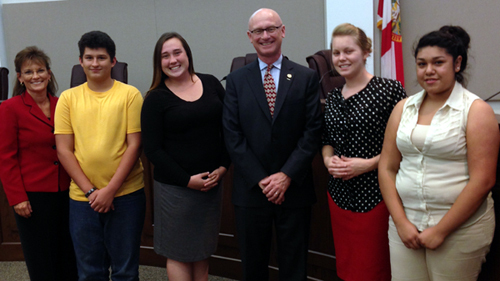 On October 4, 2012, representatives from the Students Working Against Tobacco (SWAT) Chapter in Okeechobee County participated in the 2013 Okeechobee County State Legislative Delegation Meeting. This annual meeting gives local constituents a chance to share their experiences with their representatives in the Florida Legislature. The Okeechobee Legislative Delegation consists of Senator Denise Grimsley, and Representative Cary Pigman. The Okeechobee SWAT chapter was represented by four members: Nathan Ochoa, Carly Enfinger, Anna Warren and Fabiola Guzman. This was the first opportunity for each of these students to speak in front of the Delegation. During their speech, the students highlighted just a few of the SWAT and Partnership activities. Presenting in front of the local Delegation is one of the highlights of the year for the SWAT Youth, and the Tobacco Free Partnership is very thankful that the Delegation members are so supportive of the youth in Okeechobee County. For more information on the SWAT Program in Okeechobee County, contact Courtney Moyett by calling 863-801-9140, or by email at cmoyett@quitdoc.com.